1 Ph.D. candidate of Facultat d'Economia IQS, Universitat Ramon Llull in Barcelona, Spain. E-mail: rossstewart@iqs.edu. Address: Via Augusta 390, Barcelona España 08017, Doctorands de ADE. 2 Vice-Dean and Professor of Facultat d'Economia IQS, Universitat Ramon Llull in Barcelona, Spain. E-mail: moslares@iqs.edu. Address: Via Augusta 390, Barcelona, España 08017, Deganat de ADE. They would also like to express their gratitude to the anonymous evaluators' invaluable comments; this article has benefitted greatly from their input. This article was received on January 22 2012, and its publication was approved on May 22 2012. Desde la década de 1980, India inició un periodo de crecimiento acelerado, a través de unas políticas dirigidas a la promoción de la iniciativa privada y con una marcada orientación a la economía de mercado. Este rápido crecimiento, iniciado en los ochenta, viene asociado con la aplicación de políticas de liberalización y esfuerzos de desregulación, en la década de los noventa, ante la crisis financiera en 1991. Estos y otros acontecimientos han tenido un impacto significativo en la desigualdad del ingreso en la India; por lo tanto, el presente estudio investiga la relación entre desigualdad de ingreso y crecimiento económico, con la inclusión de diversas variables macroeconómicas. Palabras clave: crecimiento económico, desigualdad del ingreso, distribución, coeficiente Gini. JEL: E01, O11, 020, 040, 053. Beginning in the 1980s, India has experienced an acceleration of economic growth by way of a promotion of a more efficient pro business and market oriented model. Following the rapid growth of the 1980s, the 1990s brought continued deregulation through market liberalization policies and additional progressive strides by way of a financial crisis in the spring of 1991. These happenings and others have had significant impacts on India's income inequality; therefore, this study endeavors to investigate primarily the relationship between income inequality and economic growth, while surveying other relevant macroeconomic variables. Keywords: economic growth, income inequality, distribution, gini coefficient. JEL: E01, O11, 020, 040, 053. Au début des années 1980, l'Inde a connu une accélération de la croissance économique par le biais d'une promotion des initiatives privées avec une forte orientation vers l'économie de marché. Cette croissance rapide a commencé dans les années 1980 et est associée à des politiques de libéralisation et de déréglementation des efforts dans les années 1990, avant la crise financière de 1991. Ces événements et d'autres ont eu des répercussions importantes sur l'inégalité des revenus de l'Inde ; par conséquent, cet article s'efforce d'étudier principalement la relation entre l'inégalité des revenus et la croissance économique, tout en incluant d'autres variables macroéconomiques. Mots-clés: croissance économique, inégalité de revenus, distribution, coefficient de Gini. JEL: E01, O11, 020, 040, 053. Many economic studies have been undertaken for the case of India on a national level, however exceptionally few look below the surface of the national experience and probe deeper into the matters of inter-state inequality and growth rates. Even India's economic planning committee continues to set national growth targets and establish other metrics to judge the success or failure of the implemented economic plans, but the government continues to ignore the significant cross-state variations, and fails to work at improving them by not establishing targets for state level production nor facilitating analysis or justification for these cross-state differences (Ahluwalia, 2000). When Indian state size and population are highlighted, this neglect of state-wise research becomes even more curious. Both by population and geographical area, Indian states are indeed comparable in scale to medium to large sized countries. Ideally, the SDP data series for individual states should be fully consistent with the national accounts estimates of GDP but this [. . . ] is not possible at present. Information on the SDP [… ] is collected by the CSO [… ]. In this process the CSO takes note of differences in methods of estimating the SDP in different states, but it does not refine the SDP series to make them consistent with each other and with the national accounts (Ahluwalia, 2000, p. 1). Given this fundamental lack of institutional scrutiny and control for arguably the most important economic indicator, SDP (State Domestic Product), the expectations one can have for other macroeconomic variables and their quality is critically put into perspective. Further complicating matters, observations for all 28 states and the 7 union territories are difficult to come by; thusly, following the methodology of leading authors who use similarly abbreviated samples of Indian states (Purfield, 2006; Ahluwalia, 2002; Chikte, 2011; Kumar & Subramanian, 2012), this study will only consider 14 of the states that are representative of both a large majority of India's total GDP and overall population. Naturally, this exclusion of more than half of India's states and union territories implies the impossibility of examination, and thusly bleakness for progress by way of economic analysis, of a still significant portion of the Indian population. A further restriction on the extant potential variables is forced due to a lack of sufficiently longitudinal coverage necessary to accommodate the goals of this lengthy time-series study, namely the period 1980-2009-10. Accordingly, the following analysis has been adapted to the, and in spite of, data limitations; a modest grouping of figures has been compiled in order to examine various fundamental relationships between income inequality and economic growth, along with the inclusion of other relevant macroeconomic indicators implied by the literature to leverage a significant effect on the two principally important variables considered in this current work. In order to provide a snapshot view of the growth experience and evolution of India's inequality over the last three decades, Figure 1 provides a glance at the divergent growth history observed between India's richest and poorest states. 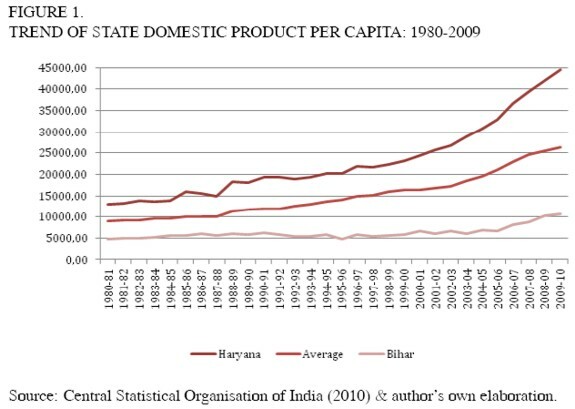 Figure 1 represents the progression of Haryana's (richest) and Bihar's (poorest) SDPPC (State Domestic Product Per Capita) levels in each observation year3, compared with the average of the 14 states considered in this study. The result shows a clear divergence between the high end and low end of states' experiences in income growth, and equally significant divergence from the average by both the richest and poorest state income levels. Figure 1 shows a clear trend towards higher levels of divergence between the richest, average and poorest state levels of SDPPC. This separation seems to accelerate at the beginning of the 1990s, and to demonstrate even further deviation during the 2000s. It is also worth pointing out that Bihar's SDPPC level mostly stagnated over this approximately 30-year observation window, whereas Haryana's SDPPC grew robustly. In fact, the increase in Bihar's average income was only 5,758 crore, while that of Haryana increased 31,394 crore. To be sure this effect is eye opening however, more complete analysis incorporating a broadened and more substantive collection of states is necessary to conclusively analyze the growing cross-state inequality. Authors remain somewhat at odds with respect to the prevailing income inequality trends observed since economic development accelerated. Singh, Bhandari, Chen & Khare (2003) maintain that some signs of heightened inequality do exist, but claim said signs are neither especially prominent nor consistent. However, Singh et al. (2003) find that on a sub-state level, intra-state levels of inequality had increased for some states. Rodrik & Subramanian (2004) find a statistically significant cross-state divergence of incomes beginning in the 1980s and continuing through the 1990s. Their data show that insignificant amounts of divergence were taking place prior to the pro-business attitude paradigm shift characteristic of the 1980s, and that after the increased growth rates of the 1980s, they find an increased rate of inter-state inequality (divergence at an annual rate of 1.2 %). Datt & Ravallion (2002) find that, excluding the two richest states, a strong positive relationship existed between 1980s income levels, and 1990s growth rates, which would indicate divergence. Ghosh (2010) confirms this statement in his study, and gives further analysis on the issues behind convergence, along with two different clubs, one converging towards the national average, and the other diverging. He claims that the heterogeneous stocks of human capital, production structures and infrastructural issues (physical, social, and economic) are to blame for the distinct growth experiences. Ghosh (2010) notes that Gujarat, Karknataka, Kerala, Rajasthan, and Tamil Nadu are converging towards the national average, while Andhra Pradesh, Assam, Bihar, Haryana, Madhya Pradesh, Maharashtra, Orissa, Punjab, Uttar Pradesh, and West Bengal, are all diverging from the national average steady state income. Ahluwalia (2002) calculates an inter-state Gini coefficient, from those results he reports acceleration in income inequality beginning around 1986-87 up to the end of his study, 1997-98. Ahluwalia's measurement of inter-state inequality was reasonably stable until the mid to late 1980s, whereupon there was a noticeable, and according to his reported results, statistically significant increase. In a field of research characterized by theoretical uncertainties and empirical ambiguities, initial results concerning the intertemporal evolution of income inequality and economic growth for Indian states in accord with the usual vagueness; however, casual observation seems to demonstrate an overall increase in inter-state divergence, and an increase in the level of income inequality, instep with the robust economic growth over the observational period. Pal & Ghosh (2007) cite the 2001 National Human Development Report covering the observation period 1993-94 to 1999-2000, as having found that of the 32 states and union territories reported, 7 states experienced an increase in rural inequality4, 15 states were found to have experienced increases in urban inequality5, and 5 states saw an increase in both rural and urban inequality (all 5 states experiencing an increase in rural and urban inequality were located in the Northeastern region of India)6. Overall trends during the observation period show that rural Gini coefficients have decreased from just below 0.30 in 1983 to below 0.26 in 1999-2000, while urban Gini coefficients have increased from 0.33 in 1983 to above 0.34 in 1999-2000. Additionally, in 31 of the 32 reported states, urban inequalitywas greater than rural inequality. Complicating the issue of national account survey data comparability, which is used to compute the Gini coefficients, is the fact that surveying techniques were changed in 1999-2000.7 Therefore, analysis on the variation of inequality before and after the survey year 1999-2000 may suffer from this difficulty, however a metric consistent with the former collection methodology has been calculated, for comparability reasons (the data consistent with prior rounds has been used for all analyses in this current work). Of the 14 states thatAhluwalia (2002) considers, he finds an acceleration of growth, accompanied by an increase in inequality. For the pre-reform period, 1980-81 to 1990-91, he finds that the aggregate average of the 14 major states considered was a growth rate of 5.2%per annum. For the post reform period, 1991-92 to 1997-98, he finds an average cross-state growth rate of 5.9% per annum. Although these results are consistent with a similar acceleration in national GDP, they do highlight a key problem concerning the comparability of state-wise and national data. According to Ahluwalia (2002), national data indicate that India grew at an average of 5.4% during the pre-reform period, and at 6.9% during the post-reform period. He attributes this inconsistency to general comparability issues between state and national accounts mentioned in the quotation from the introduction of this section, and the fact that national accounts data were revised beginning in 1993-94, whereas state-wise data were not. Apart from the variation between pre and post reform growth rates, there was also substantial cross-state growth rate variance within periods. For the average SDP growth during the 1980s, Ahluwalia (2000) documents the range varying from low to high as 3.6% per annum for Kerala and 6.6% for Rajasthan; during the 1990s that range grew from a low of 2.7% in Bihar to a high of 9.6% in Gujarat. The respective ratios of high to low growth rates are 1.83 for the 1980s (pre-reform) and 3.56 for the 1990s (post-reform). Accompanying this comparison is the addition of the factor of population growth, thusly comparing the average SDPPC growth rates, which provide for an even more contrasting growth history. 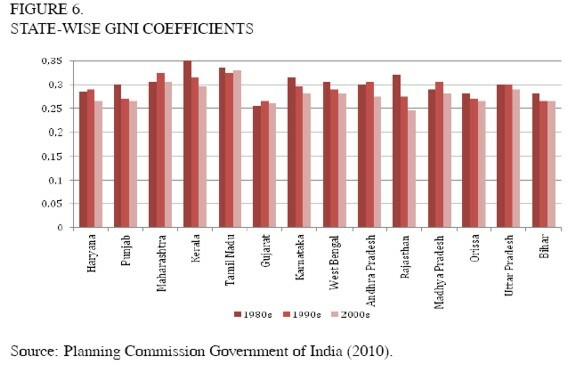 Ahluwalia (2000) reports the 1980s range to be from 2.1% in Madhya Pradesh to 4.0% in Rajasthan. For the 1990s, he finds it to be from 1.1% in Bihar to 7.6% in Gujarat. These ratios are 1.90 and 6.91, respectively. Following his methodology of high to low SDPPC comparisons, Figure 2 below displays this maximum to minimum ratio of SDPPC for the entire observation period. The trend line corroborates the findings by Ahluwalia discussed above, in that cross-state variation of SDPPC increased substantially from the 1980s to the 1990s. His analysis did not include the 2000s, but the graph shows clearly that the trend of diverse state-wise SDPPC continued to increase. 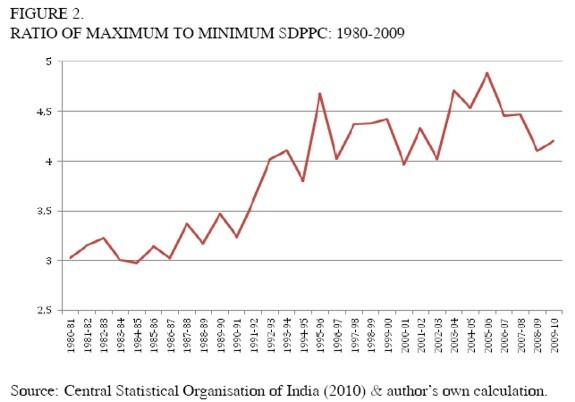 In fact, it can be seen that the minimum to maximum SDPPC only varied by a factor of 3 around 1980, but nearly reach a factor of 5 by the 2000s. Figure 2 appears to show an increasingly divergent growth pattern throughout the entire period, with a most pronounced increase beginning approximately at the time of deregulation, 1991. However, when viewing the data aggregated by decade, a significantly more pronounced relationship of divergence of incomes seems to exist from the 1980s to the 1990s, and then a further increase from the 1990s to the 2000s. In consideration of the SDPPC growth rates during the 1980s, the lowest average growth rate was observed in Madhya Pradesh, the fourth poorest state (of the 14 considered in this study) while the highest growth rate was achieved by the third poorest state, Rajasthan. This further dissection of the high to low growth ratio reveals that, what Ahluwalia claims has been "[. . . ] an unstated assumption that inter-state differences would narrow with development" (Ahluwalia, 2000, p. 1639) would not be possible with these results, as he goes on to state that inter-state differences in income levels would only diminish if the poorer states are growing faster than the richer states. This convergence is clearly not taking place in the 1980s, with the highest and lowest growing states being both relatively poor. The growth experience of the 1990s was in fact worse in that the highest average growth rate of 5.18% observed in Tamil Nadu and the lowest rate of 0.42% for Bihar, were far from the ideal that convergence would be achieved. Tamil Nadu had the 6th highest per capita income for the 1990s, and grew at 12 times the rate of Bihar, which was the poorest state. Clearly, by this metric inter-state inequality seems to have risen during the explosive growth of the 1990s. The most recent decade exhibits evidence indicative of a further worsening in the trend of divergence of cross-state incomes. Gujarat was the fastest average growing state at 6.97% per year, and Madhya Pradesh was the slowest growing, at 1.08%per year. Gujarat was the 4th richest state, observed at the last year of SDPPC available for all states 2007-08, while Madhya Pradesh was the 12th richest, only having a slightly higher SDPPC than the absolute poorest state. Accordingly, with a relatively rich state growing the fastest, and a relatively poor state growing the slowest, the trend for cross-state divergence of incomes seems to be at least not improving, and at worst widening, for the most recent decade. To investigate this relationship more explicitly, a Barro & Sala-i-Martin (1995) style βconvergence test has been undertaken, incorporating all states over the entire observation period. The 14 states' initial SDPPC levels for the observation year 1980 have been graphed alongside their respective average growth rates for the full observation period, 1980-2009-10. If absolute convergence were to be observed, then the initially richest states should have grown at relatively slower rates, compared with the initially poorer states that would have grown at relatively faster rates. Absolute convergence theory should only be applied to cases in which all individual units, in this case the 14 states, are structurally similar and have the same parameters, and thusly the same steady state levels (Barro & Sala-i-Martin, 1995).Despite the possible variations in steady state levels arising from heterogeneous stocks of capital, differing savings rates and other macroeconomic conditions, the metric nonetheless provides a clear picture of the aggregate trend. Figure 3 below displays the result of this convergence test. If a convergence trend were to be observed, the data points showing low levels of SDPPC at the beginning of the period, 1980 (X-axis), should have tended to grow at a comparatively higher average rate over the full observation period (Y - axis). However, the data presented in Figure 3 do not adhere to this ideal absolute convergence scenario. In fact, the graph and the accompanying positively sloped trend line, present evidence to support the contrary. This result indicates that the exact opposite relationship was occurring over this period: divergence. Therefore, according to this metric, cross-state inequities in SDPPC levels do not appear to be improving; indeed, the poorest states did not even grow as fast as the initially richest states but actually grew at a slower pace, serving only to widen the gap between the richest and poorest states. This result is strongly confirmed in a similarly focused recent study Kumar & Subramanian (2012); their results yield a burgeoning gap between the poorest and richest states. Despite the fact that poorer states are showing signs of progress and higher growth rates, on average the prevailing trend remains to be that the richer states are still growing faster. Figure 4 above shows both the annual variation and the overall trend line, which both clearly indicate a positive trend. The index corroborates previous support for the idea that inequality variation remained relatively flat in the 1980s, while it began to accelerate strongly around 1990. The graph shows quite clearly that inequality levels show the beginning of a steep departure from the relatively calm, yet still inclined, slope from the 1980s. Towards the end of the 1990s and on to the 2000s, the line appears to increase even further in slope. The apparent trends are confirmed by decade specific linear regression estimates run on the average annual increases in the Theil index. All coefficients were positive, indicating an overall increase in income inequality across states for each separate decade. Specifically, the estimates were: for the 1980s the trend line averaged a moderate rate of 0.0024 annual increase, the 1990s inequality trended upwards at more than twice the previous decade's speed at a rate of 0.0055 annual increase, and finally the tempo seen in the 2000s increased further to an annual rate of change of 0.0087. Taken altogether, the results from this exercise show quite clearly that between state incomes, inequality has increased significantly over the period 1981-2007- 08; in particular, these increases in inequality have been notably more pronounced beginning in the 1990s, and further intensifying in the 2000s. Overall, many authors researching in the Indian context have found results indicative of increased divergence across states. Datt & Ravallion (2002) find that evidence of divergence utilizing a similar technique as the β convergence testing executed in this section. They found a strong positive correlation with 1980s SDPPC levels and 1990s growth rates, thus indicating divergent trends of state income levels. Likewise, Nagaraj et al. (2000) find an overall increase in regional income inequality since as far back as the 1960s. They mention the fact that the poorest states haven´t been keeping up with the richest states, and not even with the national average growth trends. Given this scenario, these authors also conclude that state-wise income inequality has been on the rise, and continues to be throughout their study period. Ghosh (2010) finds that states have diverged with respect to both β convergence and σ convergence metrics, and that this experience has been most pronounced since the large-scale economic reforms were put in place. Rodrik & Subramanian (2004) find a positive relationship between initial income and growth rates for both the 1980s and1990s, despite their being outside of conventional statistical significance ranges. Kumar & Subramanian (2012), through panel regression techniques and other statistical measures, likewise find accelerated rates of cross state divergence in each decade beginning in the 1970s, and continuing through the 2000s. Chikte (2011) finds further evidence for accelerated levels of divergence, with respect to pre (1970s through 1991) and post (1991 through 2000s). By way of income inequality decomposition analysis, Vakulabharanam (2010) finds that inter-state income inequality has been an increasingly significant factor in overall Indian income inequality; this result corroborates our findings in the above graph of accelerated inter-state income disparities. Having given an introduction to the trends and intertemporal evolution of the relationship between income inequality and economic growth over approximately the last three decades, our research focus will now shift to deciphering what factors may have influenced such variations in growth rates. Our previous section's results and discussion of other author's findings show quite clearly that a below the surface look at the growth experience is necessary. To that end, we will employ the use of a balanced panel data model, with the dependent variable being average SDPPC growth rate for the three decades: 1980s, 1990s, and 2000s. 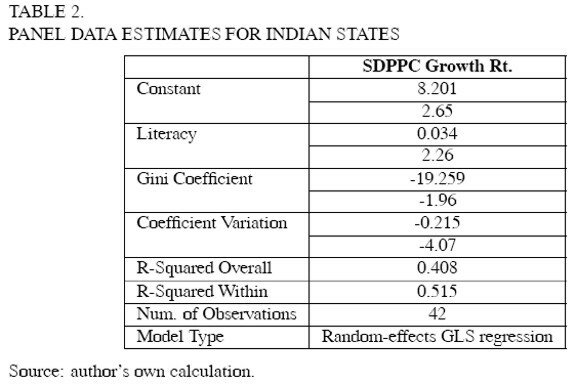 Studies employing panel data techniques are especially rare for state-wise or regional dissections of the Indian growth experience. Accordingly, we present our research in spite of the difficulty of collection of classically employed variables, and with respect to difficulty of comparability of results. The employment of a classically styled econometric analysis of Indian states is severely handicapped from the onset, due to serious state-wise data availability issues. Typically, the desired variables suffer from one or two common problems that cause difficulties for the variable's implementation in a relatively lengthy longitudinal panel data model, such as the one specified in the current study. In some cases, there is a complete absence of the desired indicator, for all states or at least lacking for some of the states considered in this study, or in cases in which observations for the desired variable do exist, an overly short window of observation periods disqualifies it from eligibility in the current model. Fortunately, over the years as India has moved along the development process, its government has correspondingly stepped up efforts at collecting state-wise data. However, it will be some time before more complete analysis, now becoming feasible at the national level, will be possible at the state level for studies researching pre-reform and reform time periods. Accordingly, this study selected from a relatively limited pool of variables that were both consistently available throughout time, and equally consistent with respect to coverage for all 14 states. With equal consideration given for classically styled equations and data availability, the explanatory variables employed in our analysis are to be state specific: literacy rates, Gini coefficients, and a measure of macroeconomic volatility. The SDPPC information was taken from the Central Statistical Organisation of India´s website, while the literacy rates and Gini coefficients were taken from the Indian Planning Commission Data Book. Literacy rates and Gini coefficients were observed as close to the beginning of each decadal panel period as possible, to capture the common design employed in cross-country panel data studies on inequality and economic growth, assuming initial conditions affect future growth rates8. It is preferable to employ observations of the explanatory variables as close to the start of the period as possible, in a lagged fashion, in order to further harmonize with growth theory. This all relates to the assumption that past values of inequality, capital, and other determinants affect future growth. Given that our study is analyzing state-wise effects, rather than cross-country effects, the design of the panel has necessarily been slightly different, but the fundamental relationships analyzed remain unchanged. With consideration for the final explanatory variable, our study calculated a coefficient of variation for each decade's growth rates, and used it to gauge the level of macroeconomic volatility for each state in each panel period9. Based on economic theory and other similarly focused empirical works, it is possible to make some assumptions about the eventual estimates of the model, between the dependent and independent variables. Results on income inequality and growth have come up with quite widely disputed results regarding the empirical relationship between the two indicators; however, there are two main schools of thought extant on the subject: that higher levels of inequality should spur economic growth through incentive and savings channels10, or the more nuanced stance that maintains an inverse relationship: inequality ought to decrease growth due to a variety of reasons, typically related to taxes, credit markets, macroeconomic volatility, and others11. The independent variables employed in this study will allow us to discern the impact they are having on growth rates, and make eventual connections to these theoretical assumptions. However, before entering a detailed description of each variable, table 1 below presents the summary statistics of the variables employed in this study. Considering the recently upgraded economic might of India, human capital investment has failed to commensurately improve in step with the large advances in aggregate output. Dreze & Sen (1995) point out that India's current literacy rates are comparable to those observed in neighboring peer East and Southeast Asian countries 40 years ago, and that India's literacy rates are similar to those recently surveyed in Sub-Saharan Africa. According to the United Nations Development Program database, India's total adult population (15 years and above) literacy rate in 1980 was just 40.8%, but the most recent data collected shows an improvement of nearly 30%, up to 68.3% for 2010. Although India was ranked just 119th of 169 countries, there has been some encouraging progress made with respect to pre-reform to post-reform literacy rates. India's aggressive economic development over the last several decades has fortunately translated into somewhat improved levels of literacy rate, despite India having much room for further advancement. It appears that India's successful economic growth over the last three decades has been met with somewhat disappointing improvements in literacy rates and presumably overall human capital development. Our observation of literacy rates as a proxy for human capital investment is forced by the absence of state-specific enrollment rates data, which are the variable typically preferred and employed in the cross-country regressions inspiring this current study. However, we assume the proxy variable literacy rates to sufficiently capture the essence of human capital prevalence in the states. The variable literacy is measuring the percentage of literate individuals over the age of 15 years in a state. Given that we employ the variable to capture the idea of human capital investment, we can compare it to the economic literature analyzing the influence of human capital on growth. The relationship between human capital investment and economic growth is found to be tremendously robust: higher levels of education are correlated with higher levels of economic growth, see for example: Alesina & Rodrik (1994), Alesina & Perotti (1996), Alesina et al. (1996), Barro (1996)12, Benhabib & Spiegel (1996), Bourguignon (1994), Clarke (1992), Deininger & Squire (1995), Easterly & Rebello (1993), Keefer & Knack (2002), Lindert (1996), Perotti (1992, 1996)13, Persson & Tabellini (1992, 1994), Svensson (1998). Therefore, if one considers literacy rate to be an acceptable proxy for the extent of education or human capital concentration in a state, it would be expected that literacy rates are positively correlated with average per capita growth rates. Figure 5 below presents the data observed for the 14 states' literacy rates. The states have been ordered from highest (Haryana) to lowest (Bihar) SDPPC in the most recent observation period to casually observe the trend between wealthier and poorer states. Overall, a pattern of higher income states having higher literacy rates appears to emerge. Ahluwalia (2000) reports that it would be expected that higher performing states would have higher levels of human resource quality. Figure 5 would corroborate this assumption. However, he finds that there is not a statistically significant correlation between literacy rates and a metric for economic performance. Despite the lack of a statistically significant relationship, the classically accepted principle that higher levels of education promote higher levels of economic development still does indeed apply14. Much of the cross-state variation is likely due to the fact that state governments are mostly responsible for their education initiatives, and not all states pursue the same strategies. Therefore, increased effort by the individual state governments where lower literacy rates are observed could indeed translate into increased economic performance and improved cross-state convergence by way of upgrading the skills of their citizens. Accordingly, this study provides some insight into the tendencies of higher performing states, to potentially serve as a developmental template for the lower performing states to follow the path of more successful growth states. Although cross-state differences are indeed present, generally speaking, strong improvements have been achieved. The trend in cross-state literacy variance diverged from the 1980s to the 1990s but then dropped precipitously from the 1990s to the 2000s. 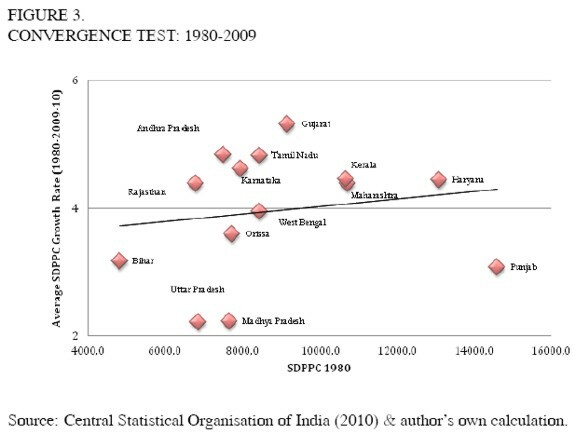 Chikte (2011) confirms this by conducting convergence tests on literacy rates across states; indeed, it is found that a statistically significant convergence has been occurring over the period 1970-2005. In all observation years Kerala had the highest literacy rate, and when compared to the lowest rate for the observation year the 1980s, from the state of Rajasthan, an enormous 48.74%difference is observed. In the 1990s Bihar had the lowest literacy rate, and the difference between it and Kerala was an even greater total difference of 52.32%. In the 2000s this gap diminished significantly to 43.86% between Kerala and Bihar. 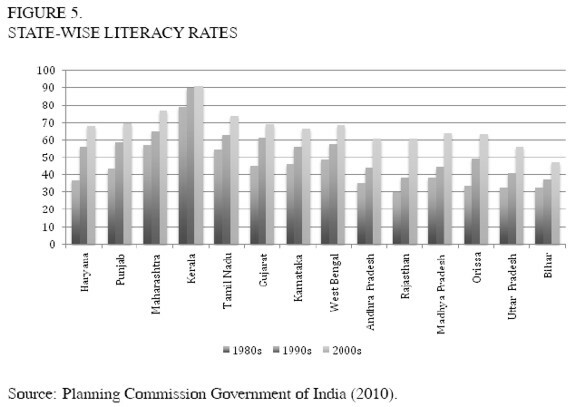 Despite the fact that cross-state divergence in literacy rates appears to be reversing, India must continue to focus resources into this area and make literacy rate improvement a top priority to strengthen economic development and decreased inequality by upgrading the skill-sets of the lesser performing states to provide greater future economic opportunities. Our empirical results endeavor to expose a reliable relationship between higher endowments of human capital investment and economic growth rate performance. The variable Gini is measuring the degree of income inequality in each respective state and has been a hotly debated topic over the last several decades of economic analysis. Despite the disaccord, it is true that the majority of authors find there to be an aggregate negative effect of income inequality on economic growth, especially in the context of poor nations. This finding has been very well documented, see the following studies for a discussion of the inverse relationship between income inequality and economic growth: Alesina & Rodrik (1994), Benhabib & Spiegel (1996), Bourguignon (1994), Clarke (1992), Deininger & Squire (1995), Keefer & Knack (2002), Perotti (1992, 1994, 1996), Persson & Tabellini (1992, 1994), Venieris & Gupta (1986). As mentioned by many authors, this finding tends to be especially true for the context of developing economies. However, typically inequality's effect on growth is considered to be neither especially strong nor robust across studies (Barro, 2000). As a result of the uncertainty, and lack of robustness of directionality regarding the empirical findings, we shall leave the expected sign on the Gini coefficient as unpredicted. Further, we present the state-wise data to be estimated in the random effects model in Figure 6. Again, the states are ordered from richest to poorest in the most recent decade of observation. Casual observation does not seem to yield any obvious result regarding a relationship between high or low levels of income inequality, and high or low levels of SDPPC. However, our regression equation will endeavor to uncover the relationship between initial income inequality and period average SDPPC growth rates. It has long been considered prudent in economic literature to consider macroeconomic volatility as an important factor in a country or region's growth experience. Given the data constraints and difficulty of employing classically focused macroeconomic variables, our study takes advantage of the readily available growth rate levels, and calculates a volatility measure. 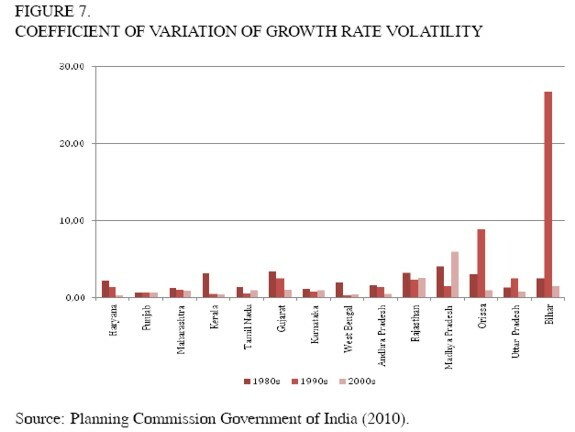 Few authors have undertaken analysis on the state-wise experience of volatility measures on aggregate output; however, Purfield (2006) does mention in her analysis that growth has been found to be most volatile in the poorest states of India. She calculates a coefficient of variation over 5 year periods for income related groupings of states; her findings indicate that overall volatility has been highest for lower income states. Our analysis seeks to quantify the extent of the related yet specific effect of macroeconomic volatility levels on aggregate output rates. Our study uses a coefficient of variation metric observed over each panel period, to measure the extent of growth rate volatility15. Analyses regarding volatility levels and economic growth tend to associate greater volatility with decreased growth rates. For example, Hausmann & Gavin (1996) find that macroeconomic volatility tends to be very costly through its negative impact on economic growth and investment in human and physical capital. Further, Ramey & Ramey (1995) indicate that greater volatility in aggregate output leads to diminished growth rates. Aghion et al. (1999) corroborate this familiar observation by mentioning crosscountry growth studies' affirmation that higher levels of volatility are linked with uniform reductions in average growth rate over the same observation period. These reductions in growth rate tend to be tied to reductions in the incentive to invest in both physical and human capital. The design of our volatility metric should then provide information on the relationship between each panel period's volatility rate, and the effect it had on average growth rate. The coefficient of variation was calculated from the SDPPC data supplied by the Planning Commission Government of India. The a priori assumption following the above discussed research is that higher volatility in aggregate output rate would be linked with lower period averaged growth rates. This assumption stems from the notion that higher macroeconomic volatility causes decreased incentives for investment; decreased incentives to invest in either physical or human capital would theoretically decrease the average growth rate, thusly establishing the inverse relationship expected between volatility and output rates. Figure 7 likewise orders the states from richest (Haryana) to poorest (Bihar), and a clear trend towards higher volatility observed in the poorer states is observed. Although a relatively calm trend seems to exist, our panel analysis will exhaustively breakdown the relationship, and we will be afforded a more sophisticated and complete means by which to analyze the effect macroeconomic volatility had on growth rates. The data were first tested using the fixed effects estimation specification; however the model was found to be improperly specified given the failure to reject the null hypothesis of a common intercept. Accordingly, it was more appropriate to respecify the model utilizing the random effects technique, drawing a constant term from a randomly distribution rather than employing a state specific constant term. Our balanced panel has been estimated using the GLS random-effects technique. When running the Hausman test, whose underlying null hypothesis is that random effects estimators are consistent, our model obtains a p-value of 0.725, indicating that random effects modeling yields a reliable result. It is true that our sample is relatively small, considering we have only 14 states observed over 3 panel periods, yielding a total sample of 42 observations. Despite the difficulties in obtaining data and studying a larger sample, our research provides a unique below the surfaceb look at state-wise growth experiences, and facilitates a discussion into what reasons may explain the heterogeneous economic experiences of 14 of India's most economically relevant states. Coefficients for the variables are presented for each variable, with their corresponding z-scores provided just below. Post analytical tests showed that the error term was normally distributed, with a chi square test statistic of 2.107, and a pvalue of 0.349, indicating that we could not reject the null hypothesis of a normal distribution of error terms. Very few studies for the specific case of Indian state-wise studies have been executed using panel regression techniques; however comments on a sampling of the rare studies are analyzed. Ahluwali (2002) regresses literacy rates with growth rates, but does not find a statistically significant relationship, and in fact the coefficient had the wrong sign. Nagaraj et al. (2000) however do find a positive relationship between literacy rates and a level of income variable, thusly indicating that higher literacy prevalence is associated with the richer states (which we have also seen tended to grow faster over our observation period), however their results were likewise statistically insignificant. Datt & Ravallion (2002) do not explicitly regress literacy rates on growth rates, however they offer unique insight into the relationship, and promote the notion that low human capital achievement by the poorer states is limiting their growth potential. Their argument states that lacking education opportunities prohibits many Indians from fully participating in the opportunities afforded by economic growth; Dreze & Sen (1995) have also made comparable arguments regarding the necessity and importance of upgrading India's poorest citizens' human capital stocks. Besley et al. (2007) present the idea that the state-wise diversity of literacy rates, and resultant growth rates, could be in part due to the fact that the Indian constitution leaves education expenditure to the responsibility of individual state level governments. Accordingly, the literacy rate improvement has varied widely in function of the commensurately mixed efforts put forth by states to increase educational achievement. The need to further improve the human capital stocks of India's poorest and slowest growing states remains a matter of critical importance. The first variable presented in table 2, literacy rate, confirms our ex ante assumption of human capital leveraging a positive impact on average SDPPC growth rates. Additionally, the estimator is found to be statistically significant at the 5% level, indicating that our result is reliable. Our study has employed literacy rate as a proxy variable for human capital investment (which is unobservable). The typical empirical result is that growth and education are positively and robustly related: Alesina & Rodrik (1994), Alesina & Perotti (1996), Alesina et al (1996), Benabou (1996), Barro (1996), Benhabib & Spiegel (1996), Bourguignon (1994), Clarke (1992), Deininger & Squire (1995), Easterly & Rebello (1993), Keefer & Knack (2002), Lindert (1996), Perotti (1992, 1996), Persson & Tabellini (1992, 1994), Svensson (1998). Given the positive and statistically significant result, our panel provides evidence to support this classical assumption, and is in line with past empirical studies. The results obtained for the Gini coefficient estimator were found to be both strongly negative and statistically significant; our variable is statistically significant at the 5% level, thus indicating we can reliably deduce that higher levels of state specific income inequality negatively affected states' period average SDPPC growth rates. In line with the literature review and the often nebulous supposed effect income inequality has on economic growth, empirical findings tend not to be robust, or especially consistent with respect to directionality (Barro, 2000). Perotti (1996) even proposes the notion that the relationship between inequality and growth may not even be significant for poor countries. Our coefficient was negative, thusly corroborating the more contemporary view of an inverse relationship between inequality and growth, and also that poor countries tend to exhibit an inverse relationship while richer countries show a positive correlation. A common empirical finding in the recent literature is that changes in inequality at the national level in India have virtually zero correlation with rates of economic growth; see, for example, Ravallion & Chen (1997), Ravallion (2002), Dollar & Kraay (2002). Exceptionally few studies investigate the relationship between initial income inequality levels and their effect on period averaged economic growth rates at the state level; therefore, comparability of state-specific results is made quite difficult. Despite the scarcity of comparable quantitative studies, a sampling of related works covering income inequality at the state level in India can provide useful abstractions for possible policy decisions. Discussions in Weisskopf (2011) summarize multitude of commentaries on potential successful avenues Indian state governments could explore to decrease their aggregate income inequality levels, and subsequently improve their growth outcomes. Arora (2012) provides definitive results showing that financial development plays a significant role in reducing income inequality in urban areas, while the author also finds rural income inequality may be affected by increasing the accessibility to finance. Both results from Arora (2012) are indeed relevant to our current study, given that we find income inequality has a negative impact on growth; the implication is then that financial development could indeed be an interesting and productive future line of research in the income inequality arena. 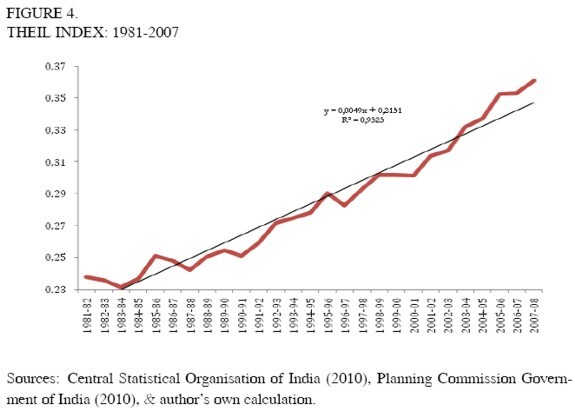 Vakulabharanam (2010) argues that Indian growth since the 1990s has not been shared in a sufficiently equitable fashion, and among other policy recommendations, suggests that greater focus on rural public investment and lending may be productive measures to bring about greater equality. Further, Vakulabharanam (2010) mentions that urban work programs be emphasized, to tap into India's tremendous endowment in labor intensive production strategies, in order to facilitate the trickle-down effect of urban economic growth. Our results for the coefficient of variation variable, as a metric for growth rate volatility, has come out as negatively related to growth rates, indicating that greater fluctuations in the growth rate is associated with lower overall growth rates. This is in line with the literature review, the related finding by Purfield (2006), and both the theoretical and empirical observations discussed in the previous section. The assumption that heightened macroeconomic volatility leads to decreased incentives for investment in human and physical capital is currently unobservable; however, possible lines for productive future research could be investigation into these volatility channels, to understand more profoundly the role they play in affecting aggregate output growth. With unusually limited data on state-wise macroeconomic indicators, and a commensurately scarce number of studies utilizing panel data focused on cross-state Indian income inequality and economic growth with which to compare results, this study has endeavored to uncover further information on why certain states have excelled and others floundered since the initiation of India's robust growth in the 1980s. Our study began this analysis by way of analyzing the evolution of inter-state inequality and economic growth, and found results consistent with a trend towards greater state-wise divergence over time. We find that divergence accelerated to continually higher levels over each of the three decades of observation. This finding is supported by other authors' research of the same trends. In the last section of the paper, we discuss the factors that may have been responsible for these divergent growth trends by using a balanced random-effects panel data model spanning the observation period 1980-2009-10. Our results provide evidence to support the notion that human capital investment (proxied by literacy rates), Gini coefficients, and macroeconomic volatility (proxied by the coefficient of variation of each panel period's output growth) are leveraging statistically significant impacts on state specific period averaged SDPPC growth rates. More specifically, it appears that literacy rates were positively related to our dependent variable period average SDPPC growth rate, while volatility and Gini coefficients were negatively linked. The trends, variables, and macroeconomic relationships explored in this paper are designed to further the important study of state-wise growth experiences in India. The country as a whole is seen as a success story, but severe cross-state heterogeneity has caused a significant portion of the country to lag behind the relatively thin sampling of thriving states. Future research is necessary to further uncover the issues underlying these divergent experiences and to aid in promoting policies directed at rectifying these disparities. 3 Punjab was marginally richer than Haryana from 1980-2001-02, whereupon Haryana significantly widened the gap, taking the position of the richest state from 2002-03 to 2009-10. Accordingly, Haryana will be considered as the 'richest' state throughout the time period. Additionally, we would like to express our gratitude to the anonymous evaluators' invaluable comments; the quality of this article has unquestionably benefitted from their input. 4 Increased rural inequality: Assam, Manipur, Mizoram, Nagaland, Sikkim, Chandigarh, Dadra and Nagar Haveli, and Arunachal Pradesh (The authors note that Chandigarh, Dadra, and Nagar Haveli are union territories, not states). 5 Increased urban inequality: Assam, Bihar, Gujarat, Haryana, Karnataka, Manipur, Mizoram, Nagaland, Punjab, Sikkim, Tamil Nadu, Tripura, Uttar Pradesh, Daman, and Diu. 6 Increased rural & urban inequality: Assam, Manipur, Mizoram, Nagaland, and Sikkim. 7 See Sen (2001), Jha (2004) for an in-depth discussion on the change of recall period from the 55th round (1999-2000). 8 Work similar to that of Barro (1991, 2000) represents the desired design. Also see Alesina & Rodrik (1994), Birdsall, Ross & Sabot (1995), Sylwester (2000), and Easterly (2000) for discussions concerning the design of similar studies. 9 The coefficient of variation is given by the standard deviation of the period's growth rates divided by its period average. 10 See for example the Kaldor (1956) savings hypothesis or indivisibility of investment theorem; see Aghion et al. (1999). 11 See the political economy argument, credit market imperfections, and macroeconomic volatility commonly presented in many articles, for example see Benabou (1996), Aghion et al. (1999), Barro (2000). 12 Barro (1996) finds a positive relationship for males, but the correlation turns negative for female human capital levels. 13 Perotti (1996) also finds that male education levels are positively related while female estimates for human capital are negatively correlated with growth. 14 See the World Bank's "East Asian Miracle" for an anecdotal recount of educational reform propelling East Asian economies into higher stratums of economic development. 15 The coefficient of variation is calculated by dividing the period standard deviation.